The enhanced Hilti TE 60-ATC/AVR SDS-max combihammer features more significant upgrades in performance and more product intelligence than ever before. For you, that adds up to more runtime and less downtime. You'll get more work done with innovative and exclusive features like Active Vibration Reduction (AVR) to improve operator comfort, Active Torque Control (ATC) to help protect the operator from kickback if the bit gets stuck and even a detachable power cord, which you can replace right at the jobsite if needed, to get back up and running. Our new TE 60-ATC/AVR is the first class of Hilti SDS-max combihammers to feature the Hilti Connect app, which lets you use any NFC-enabled device to do everything from getting a comprehensive tool history and summary to sending in a request for a repair from the jobsite. 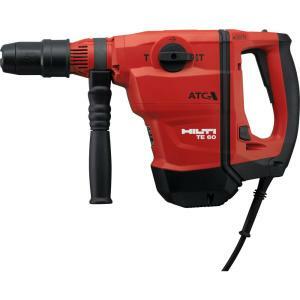 Tbook.com crawls the web to find the best prices and availability on Hammer Drills and related Tools and Hardware products like Hilti TE 60 AVR/ATC SDS Max Hammer Drill/Chipping Hammer with Active Torque Control Performance Package. For this page, related items include products we find that match the following keywords: "Hammer Drill" at our vendor partner Home Depot. Hilti TE 60 AVR/ATC SDS Max Hammer Drill/Chipping Hammer with Active Torque Control Performance Package is one of 148 Hammer Drills and related products listed in the Tools and Hardware section of Tbook.com If you have any questions on this product, please give us a call at 734-971-1210 during the hours of 9am - 5pm EST for assistance. Thank you for shopping at Tbook.com, the Internet Department Store!